"Delicious sausage, and I know exactly what's in it! Add to pretty much anything you would add meat to spice it up a bit or enjoy by itself." Stir salt, sage, black pepper, nutmeg, red pepper flakes, and ginger in a small bowl. Place turkey into a separate bowl and thoroughly mix in the spices. Form sausage into patties. 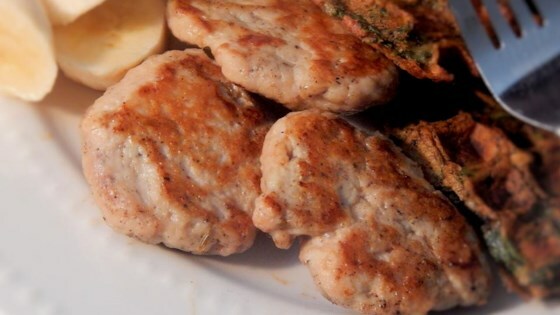 Fry the sausage patties in a skillet over medium heat until browned and the meat is no longer pink inside, 3 to 5 minutes per side. For dinner sausage or hot sausage, add 1/2 teaspoon fennel seed and more crushed red pepper. If desired, substitute ground pork for turkey and add 2 tablespoons water to the meat. Mild flavor and healthy. I will make this recipe again. very tasty, everyone enjoyed the sausages stuck to the recipe did not change anything. Good! I added fennel seeds. I just used pork and upped the sage for a "Sage sausage" for stuffing for Thanksgiving. But this is a fine base recipe for homemade sausage.